Hello everyone! It's finally April. Are you still on track with your financial resolutions? Each year millions of people make New Year’s resolutions that are about financial goals, and around this time each year most people have given up on their goals. What? It's only been three months since 2014 started! Since I have a personal finance blog, I am often asked personal finance questions (no surprise). However, whenever I answer questions, I am often given a list of excuses about why people can't pay off their debt, why they can't save for what they want, and so on. One question I recently received was how a person could properly budget so that they could pay off their $13,000 in credit card debt. The first thing I said was that they needed to CREATE A BUDGET! I told them they needed to start with an Excel spreadsheet for their budget so that they could track what was going on with their budget, make changes easily, and so on. Then, I found out about Savvy Spreadsheets. I had the opportunity to interview Janet Kim, who has a budget spreadsheet side business. Janet is a woman in her 30’s living in New York City, and she's a huge Excel geek. Most of her experience with Excel comes from her day job (she's a retail planner for a luxury fashion brand), but in recent years she started creating spreadsheets to help her organize her personal life. When friends and family started asking her for her spreadsheets, she realized she could actually start a business doing something she loved – creating Excel templates! She launched Savvy Spreadsheets last year, as a resource to download her easy budget templates that everyone seems to love. Savvy Spreadsheets has since grown to offer more downloadable templates, custom spreadsheets, and customization services. Below is the interview I had with her. Me: How has budgeting helped you? Janet: I’m a little embarrassed to admit this, but I didn’t actually start budgeting until two years ago. You would think someone who earns a living by creating budgets for a multinational, multimillion dollar company would be a little bit more in control of her personal finances. 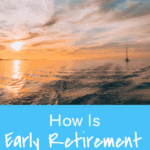 I realized something had to change when I always seemed to be living paycheck to paycheck, despite the fact that I was moving up in my career and seeing regular pay raises. In my first four months of budgeting, I saved almost $3,000. I was hooked! 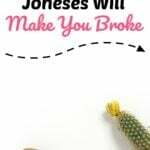 I knew exactly where my money was going, and every time I wanted to make a big purchase, I knew without a doubt whether I could afford it or not. What made you want to create these budgeting spreadsheets? When I first decided to start budgeting, I actually looked for a free Excel template online, and even tried some online services. They were all too scary for me. The Excel templates had so much going on – numbers, formulas, and lines all over the place. They looked so busy that they were actually stressful to use. The online services seemed cleaner and nicer at first, but they ended being even more complicated than the Excel spreadsheets! I also didn’t like the idea of having my budget somewhere in “the cloud,” and just felt more secure with an offline spreadsheet. Then I thought, what good is all of my work experience if I can’t even make my own budget spreadsheet! It took me about a month to create a budget spreadsheet exactly the way I wanted. What are the differences between your three budget spreadsheets, the Super Starter Budget, the Super Basic Budget, and the Super Deluxe Budget? 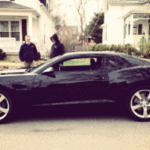 The Super Starter Budget is an incredibly easy, introductory, one-month budget. You pick your expense categories, you enter your spending, and you see where your money went. There’s a simple pie chart to show you where you’re spending the most. It’s super clean, easy, and fun! The Super Basic Budget is a full 12-month version of the Super Starter Budget. It has more categories and a summary report that tracks your spending month by month. The Basic budget sells for $5. I’ve had so many people tell me how much they love using the Super Basic Budget and that it was exactly what they were looking for but couldn’t find previously. Some people started asking me to customize the Super Basic Budget for them because their finances were just a little more complicated than the Super Basic Budget could handle. I took the most requested customizations and incorporated them into the Super Deluxe Budget. The Super Deluxe Budget has subcategories, more analysis charts, adjustable monthly budgets, and many more features. The Super Deluxe Budget is quite a bit more sophisticated than the Super Basic Budget, and took me much longer to perfect. It sells for $15. How do you think your budgeting spreadsheets can specifically help someone? 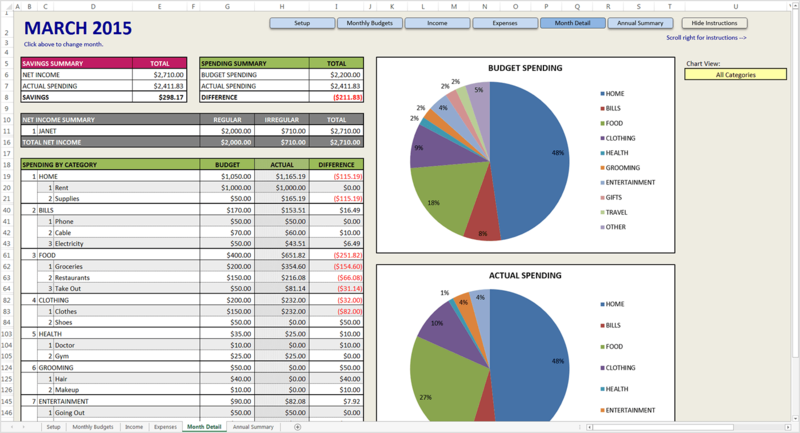 Are your spreadsheets just for budgeting beginners? 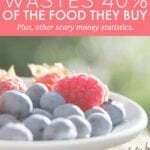 My spreadsheets are not just for budgeting beginners, they are designed for anyone that just wants to budget in an easy way, regardless of if they are new at it or have been doing it for years. There are a lot of people out there who are still not budgeting just because they’re intimidated by scary looking spreadsheets or complicated online tools. My user-friendly templates are perfect for them. My spreadsheets have easy-to-follow step by step instructions that tell you what you need to do and nothing more. 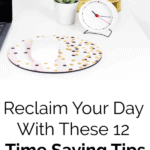 You can literally set them up in a matter of minutes. As for those who are currently budgeting, but want something simpler than what they’re currently using, my spreadsheets are meant for them as well! 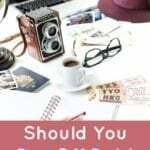 I think most people, myself included, will not keep up with a budget if it’s time-consuming, stressful, or just plain boring. My spreadsheets are none of these things, and dare I say, I actually enjoy budgeting now. What does a person need in order to use your budgeting spreadsheets? All three budgeting templates require Microsoft Excel, and it needs to be a newer version – 2007 or 2010 for PC, or 2011 for Mac. As easy as they look, the background mechanics are quite complex, and they require some advanced features of Excel that older versions simply don’t have. Does it only work for those in the U.S.? Nope! My templates can definitely be used outside of the U.S. and in fact I have many international customers. You can even change the currency symbol on the Super Deluxe Budget to reflect your country’s currency. Some of my international customers have even asked me to make additional customizations on their spreadsheet, such as changing the way a date is formatted, so that it would make more sense for them. That’s the real beauty of Excel. You can customize any spreadsheet to become exactly what you need. And now with Savvy Spreadsheets you don’t even have to do it yourself, I can do it for you! 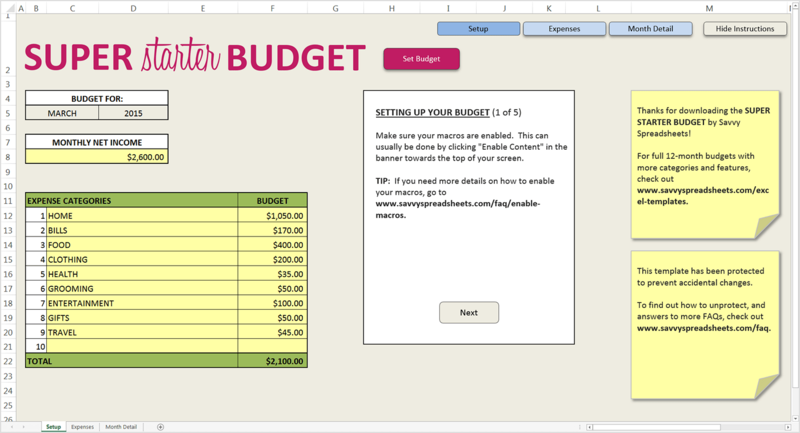 Do you use a spreadsheet for your budget? Do you even have a budget? Why or why not? Edited on March 25, 2015. I do have a budget application on my Smartphone, it’s very helpful because I can record my expenses and income, but sometimes I forgot to record some of my expenses. Btw, thanks Janet for the spreadsheet I already downloaded it, it’s so user friendly. Yes, her budget spreadsheet is great. I hope you benefit from it. We don’t use a spreadsheet but we do have a fairly thorough budget. I would consider using a spreadsheet if it got more complicated than it is now! I’m guilty of not tracking our budget super closely. It is something that I need to change! We budget about once every 3-4 months. We try not to revisit our budget more then this otherwise it becomes overwhelming. We’ve created some simple stuff in excel to track our expenses (probably nowhere near as nice as these spreadsheets). We find it works really well for us. Sounds like a great plan for you guys! I’ve never used a spreadsheet for my budgets. I prefer Mint. However, I do budget twice a month since that’s how I get paid. Mint is great also. Thanks for stopping by! I use a spreadsheet because I like being able to customize the way I like, which is hard with the online software like mint. Yes, I’m the same way! I love Excel and this is good to use. I run excel spreadsheets everyday in my job and create custom ones as well. I think her product is good. Geez! I’ve been tweaking my budgets every single year to get it exactly how I like it. That’s great she came up with the best template right off the bat! Excel has been so important in my financial progress. I much prefer using Excel over Mint.com or any other software. I use a spreadsheet for our budget but I also use Mint.com to help add up the totals. It is the best of both worlds and makes the budgeting process a lot less time consuming. I’m a melancholic type of introvert so making a tally in a spreadsheet for my income vs expense comes naturally to me. It might be difficult for her to naturally budget since she has a high income living in New York. Them women loves to spend and that city has a high standard of living. Now that she can budget will lead her to more retirement options i hope. For me it’s important to have a budget so I can remind myself how much I spend and helps think twice if I want tos splurge on something. Having a spreadsheet does help for my budget, so I can keep track of my spending. We have a budget (kept in Excel) that my husband came up with. We look at our expenses and budget at the end of every month and evaluate our savings and debt payoff. We’ve gotten much, much better about communicating and discussing (as a team) large purchases before we make them. That has helped a great deal. As a HUGE Excel nerd I love what Janet’s put together! I just checked out the Savvy Spreadsheet website, definitely a cool resource (keep up the great blogs). I technically don’t budget, but I do track all our spending in an Excel spreadsheet.